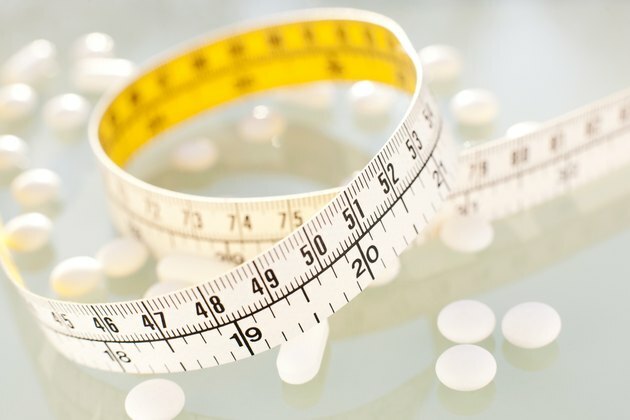 Phentermine, which is sold under the brand name Adipex-P, is a prescription appetite suppressant; it belongs to a class of drugs called anorectics. Doctors prescribe phentermine along with a low-calorie diet and exercise program to treat obesity. Many supplement marketers claim their products provide similar appetite-suppressing benefits, and some even go as far as to give their product a name that sounds similar to phentermine and Adipex-P. However, at this time, no over-the-counter phentermine alternatives are proven to work. If you're looking to keep your hunger in check while on a reduced-calorie diet, try some practical and easy-to-implement dietary strategies that have staying power. Incorporating foods rich in long-chain omega-3 fats may help keep you full so that you stick to a lower-calorie diet during weight loss. Scientists tested the theory that long-chain omega-3s play a role in your feeling full after eating. In the experiment, two groups of overweight volunteers followed a balanced, low-calorie diet: One was rich in long-chain omega-3 fats, while the other wasn't. The long-chain omega-3 group felt significantly fuller both immediately and two hours after eating. This evidence supports the idea that long-chain omega-3 fats have an appetite-suppressing effect. Oily fish such as salmon, tuna, mackerel and herring provide the most long-chain omega-3s, EPA and DHA. Plant foods such as flax seed and chia seed contain omega-3s, but in the short-chain form of ALA, which is converted to long-chain omega-3s in your body. When used in place of other types of carbohydrates, resistant starches caused volunteers to eat significantly less food over the course of 24 hours, according to a study that appeared in the British Nutrition Journal in March 2010. Resistant starches resist digestion; instead, they are fermented by bacteria and converted to short-chain fatty acids. Researchers aren't yet sure how resistant starches reduce food intake, but foods rich in this type of fiber-like starch are nutritious, whole foods, so it's worthwhile to incorporate them into your meal plan. The amount of resistant starch in foods changes depending on how the food is prepared. Resistant starches are highest in foods that are cooked and then allowed to cool, as well as some raw foods. The richest sources are cooked and cooled potatoes, beans, lentils and other legumes, as well as cooked and cooled whole grains such as oats, barley and rice. Other rich sources are raw potatoes, green, unripe bananas and plantains. Dietary fiber, the indigestible portion of plants, is linked to promoting feelings of fullness. Particular soluble fibers such as beta-glucan appear better at reducing hunger than other types of fiber. In clinical data, compared to eating wheat, volunteers who ate barley, a rich source of beta-glucan, reported feeling significantly less hungry, according to a review appearing in the December 2011 issue of the Journal of Nutrition and Metabolism. The two richest sources of beta-glucan are oats and barley, so try incorporating these, along with other foods rich in fiber, into your meal plan. Beans, lentils and other legumes, as well as whole grains are rich in dietary fiber. If your current diet is low in fiber, increase it slowly. Boosting your intake too quickly may cause gas and other gastrointestinal symptoms. A change as small as putting less food on your plate at a time may help reduce your food intake, suggests data that the Cochrane Database of Systematic Reviews published in September 2015. After reviewing 72 studies published between 1978 and 2013, researchers found a link between portion size and overeating. The authors note some limitations, such as poor study designs; however, limitations aside, reducing your portions is a sensible idea that may help keep your food intake in check. A good idea for snacking is to use baggies to pre-portion your snacks so they're ready when cravings strike. This way, instead of reaching into a large bag of pretzels, where you could easily lose track of how much you're eating, you'll have small snack portions ready to go ahead of time. Know the rules of thumb for portion sizes. For example, a serving of meat is 3 ounces, which is about the size of a deck of cards. A 1-cup serving of dry cereal is equivalent to the size of your fist, and a snack-size portion of nuts is 2 tablespoons, which is about the size of a ping-pong ball. Familiarize yourself with appropriate portion sizes and carry a cheat sheet such as an index card for quick reference. Why Does Pasta Make Me More Hungry?